Claude Monet's Trees tapestry shows the work of Claude Monet from 1891. This scene shows a windswept scene providing a magnificent sense of movement. The tree foliage is seen flowing to the left, as are the grasses below. The clouds are formed and thick in the sky, and provide a sense of atmosphere. Also known as Poplars (Wind effect), this work is one of the many works Monet created in the summer and autumn of 1891 and were based on the marshes along the banks of the Epte river, close to the home of Monet himself. With a style in impressionism this work is a beautiful work from this era of Monet's paintings. 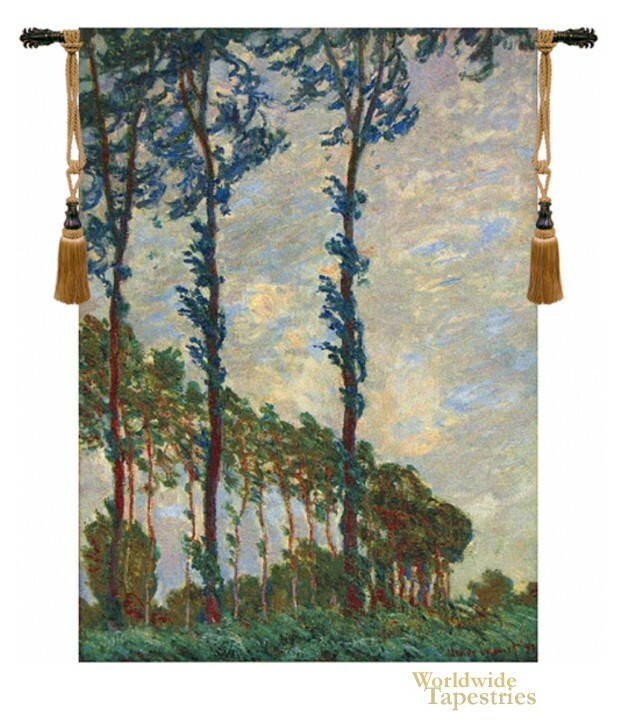 This Trees - Monet tapestry is backed with lining and tunnel for easy hanging. Note: tapestry rod and tassels, where pictured, are purchased separately.